Vietnam veteran S. Brian Willson paid the price for peace as he was run over and nearly killed by a military train during a non-violent protest at The Concord Naval Weapons Station in California on September 1st, 1987. The train was carrying weapons that were to be shipped to Central America and used to kill innocent civilians in Nicaragua, El Salvador & Guatemala. Since then, Brian has not stopped calling attention to the US government’s defiance of international law through waging endless illegal wars. “PAYING THE PRICE FOR PEACE” exposes the truth about the United States’ addiction to war and the lies it perpetuates in order to wage ongoing violence. Brian’s story is very moving, inspirational and educational. S. Brian Willson has paid the Price For Peace in lifelong regular installments and his commitment assures us that truly one heart with courage is a majority. – Martin Sheen: Actor & Activist. I love Brian. And I love this film. I wish that every American, interested in truth, could see it. Since his time in Vietnam, Brian’s life has been about revealing the dark side of US foreign policy. This very important film, which includes many of Brian’s friends in the anti-war movement, also talks about how U.S. militarism is one of the biggest contributors to Global Warming. – Daniel Ellsberg: Author, Activist & Former Military Analyst, who revealed The Pentagon Papers to the New York Times in 1971. After viewing PAYING THE PRICE FOR PEACE, I cannot remember a film that has touched me so deeply, that resonates so intensely with the power of commitment, love and sacrifice. I have come to know the life and work of S. Brian Willson though his great book BLOOD ON THE TRACKS as well as a few personal meetings over the years. The film dramatizes his extraordinary life and work in new ways, assembling the voices and experiences of so many who have been impacted by his incredible journey. Willson’s presence on the American scene has been nothing short of transformative. As an author of several books on the destructive impact of United states militarism, I have found dozens of invaluable sources on the topic, but none more so than this film and the book that so powerfully capture Brian’s unique contributions to the struggle for peace and justice. As a veteran myself (though fortunately not in any war) and someone raised in a military family, I especially value his truth-telling about a system that is anything but virtuous or peaceful. There is a fierce and direct honesty about the way he describes the terrible costs and consequences of the military machine throughout U.S. history. As someone engaged in antiwar work since the 1960’s, I see in Brian’s life-story, an enduring inspiration for those of us struggling to end the long U.S. addition to war and finally, to dismantle a warfare state that threatens the survival of every living thing on the planet. Never has a film been more urgently needed. – Carl Boggs PHD: Professor of Social Sciences at National University LA, Author of several books on US military & foreign policy including: THE CRIMES OF EMPIRE, THE HOLLYWOOD WAR MACHINE & ORIGINS OF THE WARFARE STATE. “PAYING THE PRICE FOR PEACE” is truly an important and essential work of history and art. It is so much greater than a biographical documentary of Brian Willson, although it triumphs in its telling of Brian’s story. And it is much more than a terrifically put together and well edited visual narrative and history, which it certainly is. For these reasons alone, it is a film worth watching: gripping, inspiring and powerful in its retelling of Brian’s life before and during the Vietnam War and his commitment to peace and justice and especially his sacrifice after Vietnam. It is the history of the peace movement after the Vietnam War, especially in the 1980s. And for those of us who were children during that time, this is the sacred history of those who have come before us. Stories of men and women who accompanied Brian in his peace work are plentiful in the film and they provide a rich accounting and record of the acts of many who bodily, intellectually and spiritually opposed the madness of the militarism of the Reagan years; a madness that goes on. To say I learned a tremendous amount is an understatement. If there is required viewing for those of my generation and younger, so that we can know, acknowledge, respect and follow those who have come before us in the Peace and Justice Movement, it is “PAYING THE PRICE FOR PEACE”. Invest the time in watching it. You will have a wonderfully rewarding experience. – Matthew Hoh: Senior Fellow, Center for International Policy, Marine and State Department veteran of Iraq and Afghan wars. These are very challenging and dangerous times. We need people who can inspire us to resist. I highly recommend seeing: ‘PAYING THE PRICE FOR PEACE: The Story of S. Brian Willson’. Brian and the other people in this very important film, show us and lead us in resisting wars being waged by the United States. These illegal and immoral wars have devastated and killed millions of innocent people in the third world”. – Father Roy Bourgeois: Naval Officer in Vietnam, former Maryknoll Priest and Founder of The School of The Americas Watch. “PAYING THE PRICE FOR PEACE” is the remarkable story of a remarkable man willing to give his life for peace. Brian Willson risked his life for the people of Central America, who were being killed by U.S. bullets and bombs. Brian paid the price for peace with his legs and almost his life. The rest of us are paying the price with our souls”. – Col. Ann Wright: Retired United States Army Colonel and U.S. State Department Official. “There are few in this world who would unselfishly risk their lives for humanity’s sake. S. Brian Willson is one such individual. He paid an enormous price in an effort to help the innocent civilians of Central America by unmasking the truth about US. foreign policy and militarism. His is a dramatic, inspiring, emotional story of one man’s commitment to resistance and nonviolence.” – Joan Baez: Singer and Long-Time Activist. 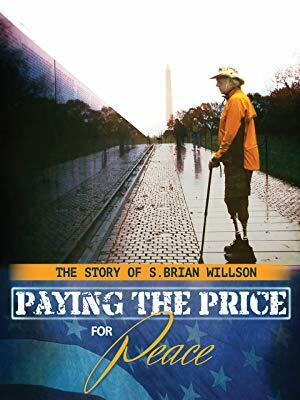 “I had the privilege of seeing an early copy of PAYING THE PRICE FOR PEACE and then the honor of interviewing Brian Willson on my KPFK public affairs show about the movie and about his life. Now, I’ve spent over 50-years in the anti-war movement, met and worked with some of the great national leaders in that movement, including many who sacrificed much to win the peace we all sought. But no anti-war movie that I’ve ever seen and I’ve seen dozens, and no one single individual that I’ve ever met, has had a more profound impact of my emotions and my thinking about war and anti-war movements and what it means when one person truly and completely, “puts it all on the line,” than the movie PAYING THE PRICE FOR PEACE. If you have the good fortune to see this movie, you too, will get to know Brian Willson and through him learn what one extraordinary person can do to inspire others and thereby advance the cause of peace for all human kind.” – Jim Lafferty: Executive Director of The National Lawyers Guild/LA, Host of The Lawyers Guild Show on KPFK 90.7 FM Radio.